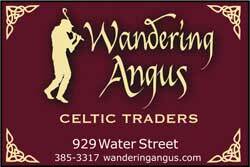 Wandering Angus is NOT just another Celtic shop. We are regional experts on Celtic history, travel and culture. We support quality manufacturers and individual artisans in the British Isles, Ireland and North America. Through educational and cultural events, we enlighten, entertain and feed the intellect of those curious about Celtic ancestry, politics, spirituality and cultural arts and thereby create community and support the development of Celts everywhere.